A San Diego based group that discusses computer based music. We meet every once in awhile at the Sonic Arts Gallery. Typically once a month on the 2nd Friday at 7pm. Meeting discussions are usually posted there. Anyone is welcome to join in and listen to what's going on or share your thoughts on Computer Music. We welcome anyone - you don't have to live near San Diego to participate. Good crowd tonight. The main subject was a microtonal plugin released by Xen-Arts.com - Xenharmonic FMTS. 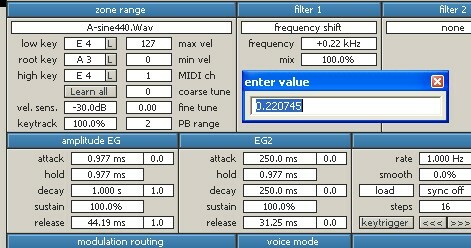 This is a 4 Operator FM synth that is subject to tuning of midi key triggers using MTS (Midi Tuning Standard) files. Each oscillator can be excited with a variety of wave shapes. Then iscillators can be made to modulate each other using 37 different algorithms supplied with the synth. Oscillators can further shape the output using individual Enevelope Generators. Harmonics can be added to the output using partials defined in text files. Included in the synth are LFO's, filters and a variety of other ways to influence the sound output allowing for production of the typical lush sounds of an FM synth. We browsed through almost 4000 tuning files from the Scala Archives and selected several different .scl files for just intonation and frequency tunings. Using Scala, we converted a couple of these tunings to the MTS .mid files (using SET SYNTH 107) and copied these tunings into the FMTS folder. Several new patches were programmed using the new tunings. Patches can be saved using the Patch Management button on the synth. The major gripe is the huge size of the GUI which more than fills the screen. In Fruity Loops (FL Studio) it was necessary to detach the window in order to move it around to be able see all of the controls. In Mulab, the GUI fills the screen and can't be moved! The title bar can't be grabbed with the mouse to move it and some of the GUI is off the screen. This was especially bad on Monz' Linux netbook, where only the upper half of the GUI could be used. We did produce some usable music, but none was saved for production. As you can see from the screen capture below, it has an extremely large display. Another plugin that was briefly discussed was the SuperDrumFX plugin which does an excellent job in producing drum tracks from midi input. Supplied with this software is a nice set of 3 sampled acoustic drum kits and all the necessary presets to reproduce almost any drum sound desired. Controls for each drum sound are creatively designed. Setup for this plugin is a little tricky, so be sure and read the instructions. The results are extremely worthwhile. Brink provided the coffe service - chocolate/almond this time. Superb. We had a quick review of Reaper - which is now a very mature Audio Workstation - and has extremely sophisticated features for creating music. Click on Trash Talk (MP3) to hear the tune that was demonstrated in Reaper showing how some effects could make for significant improvements on the midi drum track . The CS12 (Channel Strip by Terry West) effect is extremely useful to give more depth to the drum track, especially in separating and independently modulating the Right and Left portions of the stereo track . The RhinoCM synth was reviewed. This is a powerful FM synthesizer VST plugin that was just released on the Computer Music magazine cover disk for July. 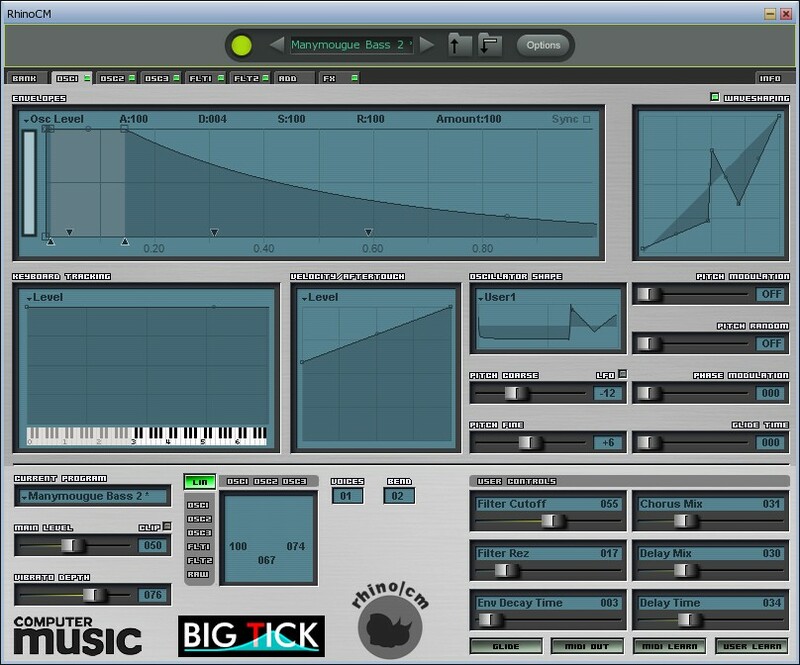 It is a lite version of the Rhino synthesizer offered by Big Tick Audio. One of the nifty features of the RhinoCM is the ability to scale the output on any known microtonal scale by simply selecting a .TUN file as part of the preset. .TUN files are widely used in many audio software applications to map midi notes to scaled output. In this application we featured a piece created in Mulab using the RhinoCM synth which uses a preset in the Pythagorean-C scale. Click on When When (MP3) to listen to chords created in Pythagorean C.
Scala was used to access the Scala archives, which contains a huge assortment of microtonal scales in the .SCL file format. (Instructions for converting .SCL to .TUN.) A quick demo was performed to convert one of Monz' scale creations - monzo_pyth-quartertone.scl file - into a .TUN file which was then selected into the RhinoCM and Monz used the keyboard controller to pound out the quarter tone scale. Jonathan also loaded up his favorite 19 equal scale and played one of his 'blues' numbers. Next time we will record this gem. Roland has recently released the 'Gaia' SH-10 synthesizer with a 37 note keyboard controller with some awesome features. Here's the video that was shown. The Guacomole dip was delightful and zesty - Thanks Jonathan for the chips and dip. And if you stayed late, Brink brewed up some terrific coffee, as usual. Meetings for the summer months of July and August may be precluded., so look for announcements in the MusicByComputer Group. May 14, 2010 - 7pm. All of these apps were demoed and all run from a single flash drive plugged into a laptop. - Midi Editor - Brels tiny midi Editor - very tiny indeed 110KB! - Sekaiju - powerful midi editor - Excellent, but takes awhile to learn. - MuLab - 3.0 on a thumb drive - Complete DAW with advanced features. Monz created a spreadsheet that was used to calculate the number of cycles to shift each key that was designated to play at the frequency desired. In our example we used consecutive midi keys beginning with A3 (the root frequency 440hz of the sample we used). In this case, the ShortCircuit VSTi was loaded into MuLab 3.0 and a synth (Extractor) was used to create a simple tone that had a minimum of harmonics so the frequency could be double-checked within the SPAN VST module. The tone was then rendered as a 2 second tone and saved as a WAV file. The file was loaded into ShortCircuit and spread across 8 consecutive midi keys beginning at A3. The Frequency shift that was calculated in the spreadsheet was entered in the Frequency Shift box for each midi key. It was noted that the shift is based on the frequency that would normally be produced by the GM midi key. Here is a screen shot of the ShortCircuit Frequency Shift entry area. After all tones have been shifted, the resulting microtonal sample set can be saved as a preset for use in any host sequencer by using the assigned midi keys. At the next meeting we hope to have a new working instrument based upon a full scale of tones using more realistic samples. Also demoed were a host of videos of bizarre instruments and several Protools examples of completed projects. We went over many of the features of the new MuLab 3.0 that was just released today. The entire demo was conducted using a copy of MuLab 3.0 on a laptop PC USB stick. MuLab is the 3rd generation of a midi/audio sequencer and host platform that now runs on Windows, MAC OSX and Linux. During the demonstration, Monz downloaded a copy of the new MuLab 3.0 and installed it on his netbook running Linux Slitaz under WINE. The basic functions of setup and sequencing were completed OK, but we ran into problems trying to use some balky VST modules under WINE. Some less complex and straight forward synths and effects plugins that will probably not cause problems under wine can be obtatined from the Togu Audio Line. The Elek7ro and Bassline are especially useful. Here are two of the MuLab tunes demoed on the USB stick -- Jazzy Guitar and The Shiny Lizard. The latter tune uses only presets and synths that are supplied with MuLab. 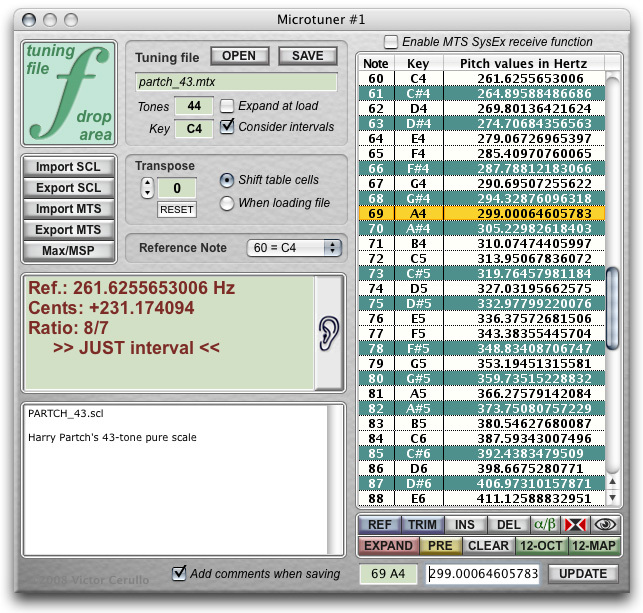 Microtuner is a basic midi module that loads a Scala text file with tuning information. Input to the module is a standard midi note event which is then altered, based on the tuning scale, by adding a pitch bend control which is then output as both an event and a controller change. The output can go directly to a synth (in the host) that accepts pitch bend to create the new pitched sound. In MuLab the midi output can be directed to another synth by placing them in series or directing the event output to another rack. Microtuner is available for download as part of a suite of midi tools (The Midibag created by Tobybear). The use of pitch bend cc to alter the midi info is simple, but limits the practical out put to single note events sent one at a time. In this demo we sent the altered events to a piano synth. ZynAddSubFx is another Microtonal synth plugin that works well in MuLab. This plugin accepts 16 midi channels of input so can be used to drive many different sounds at once. The sounds are all created within Zyn. The GUI looks a little rugged, but is very complete. The synth comes with many presets of sounds some of which emulate real instruments. In order to use the Microtonal abilities, you must first click on the Misc. tab and select Advanced view. Here you will find a Scales button that allows loading of .scl tuning files which can then be mapped to specific keys on a standard midi controller keyboard. We demoed the Zyn by loading several different tuning files and setting up different tracks in MuLab - all routed to a single instance of Zyn along with drums in another track using the MuLab built-in drumset. 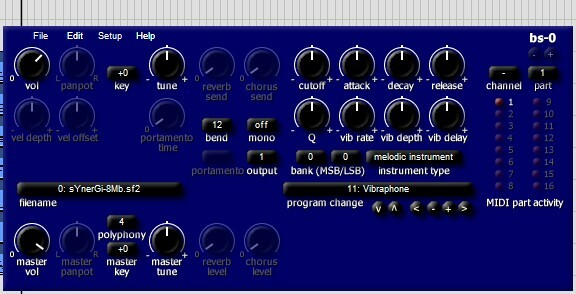 ZynAddSubFx also runs as a standalone synth on a PC, MAC OSX or as it was originally developed - on Linux. Rounding out the evening we played through a couple of videos - Extractor synth (which runs nicely in MuLab) and the old Chamberlin Rhythmate - the very first drum machine - created in 1949. Thanks to Jonathan and Brink for the fantastic guacamole dip and coffee service. First demo was the Soundborb. This is an ambient background sound generator which can generate ambient styled audio sounds for years without repeating itself.Currently only available on the Windows platform. It has a clever algorithm that uses supplied OGG files and loops these sounds together at random intervals to produce a continuous stream of audio for a pleasant (or unpleasant) background. You can choose the style from a broad selection available at Soundborb.com. A few adjustments - Level, Intensity and Happiness - allow you to adjust the style to your taste. 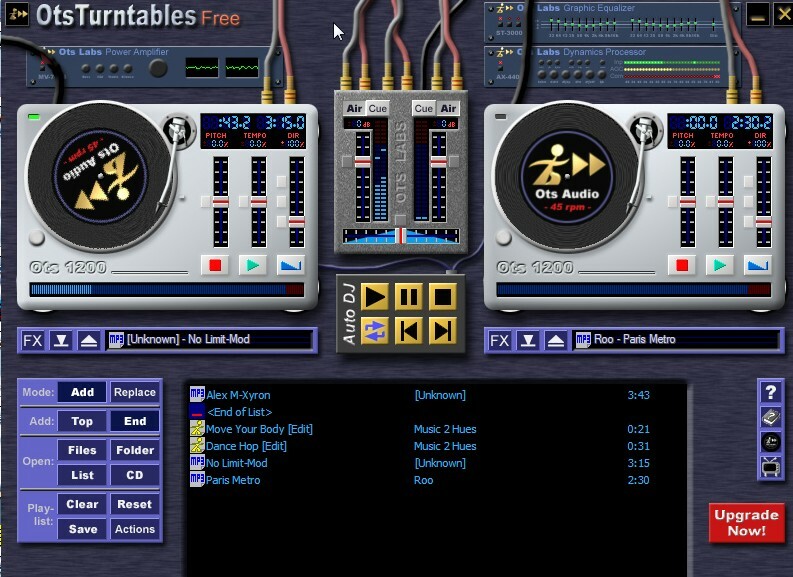 OTS Turntables - from OTS Audio - is a DJ program for Windows that is very flexible. It comes in the free version - some features are disabled - and the Pro version - which allows a full range of enhanced DJ functions. The program is simple to use and allows for selection of play, crossfade transition, tempo and pitch adjust, individual sound level, scratch, and playlist creation on the fly. Audio files may be WAV, MP3, CD or OTS Audio. The latter are enhanced for DJ operation. A nice feature is the ability to load selections directly from a CD on the fly. Much of the meeting was spent reviewing and listening to a variety of Renaissance styled music played through the Melody Assistant with songs created in midi format on a MACbook. One of the primary sources for this styled music is the Choral Public Domain Library where thousands of Rennaissance pieces have been scored and are available as sheet music. Most are done in Finale format, Midi files and PDF scores. Also announced was the pending release of Mulab 3.0 which is just finishing the final stages of Beta testing. Examples developed in Mulab 3.0 will be available at the next meeting. The Milky Tracker was a principal discussion at this meeting. 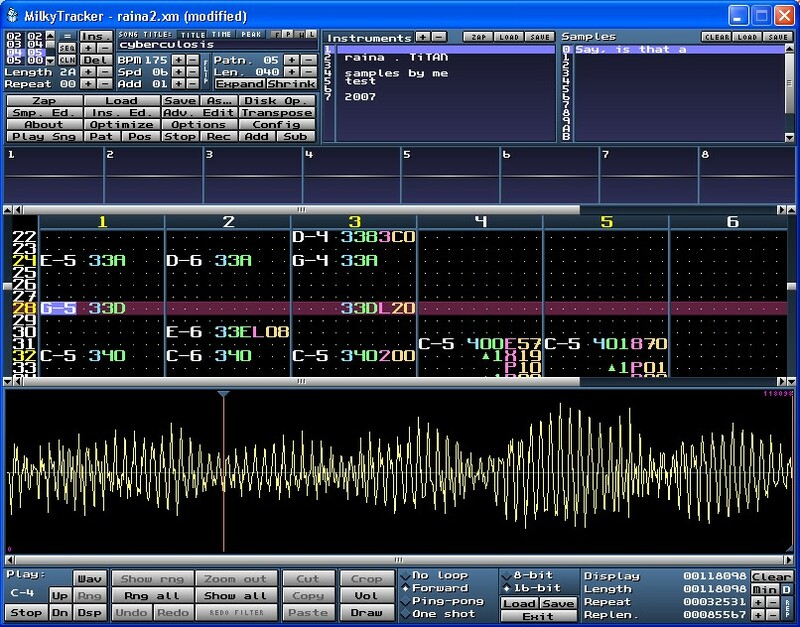 It is a tracker music creation system using a typical matrix of directives - rows representing notes, pitch, instruments, effects and columns representing polysonic channels. Each matrix can be saved as a pattern (Order) and Orders can then be sequenced to create a song. The matrix is processed from top to bottom and each row can contain multiple processing 'ticks' to execute effects at a predesignated BPM. The Milky Tracker is distributed for MAC, WIN and Linux and music modules that are created can be palyed and edited on all three platforms. Instruments are embedded in the module and instruments may have one or more samples. The samples can be imported or created within the sample editor. The note pitch, volume, and variations to the envelope are entered in the pattern matrix. Modules (MOD files) containing the patterns, and samples are saved as .xm files by the Milky Tracker. MOD files are typically a magnitude smaller than MP3 files and have excellent quality. We also distributed a copy of the Brels Tiny Midi Editor for Windows. This tiny midi editor is housed on a USB stick and allows complete editing and playing of midi files. Just plug it in and run the Editor. ... An enjoyable evening that featured some of Jonathan's Guacamole dip. The music included a track from Jonathan and Brink's CD of extemporaneous synthesized improvization. An attempt was made to use some of the mastering tools now installed on the MAC to add some depth and remove some of of the lower frequencies that could muddy up bass line. 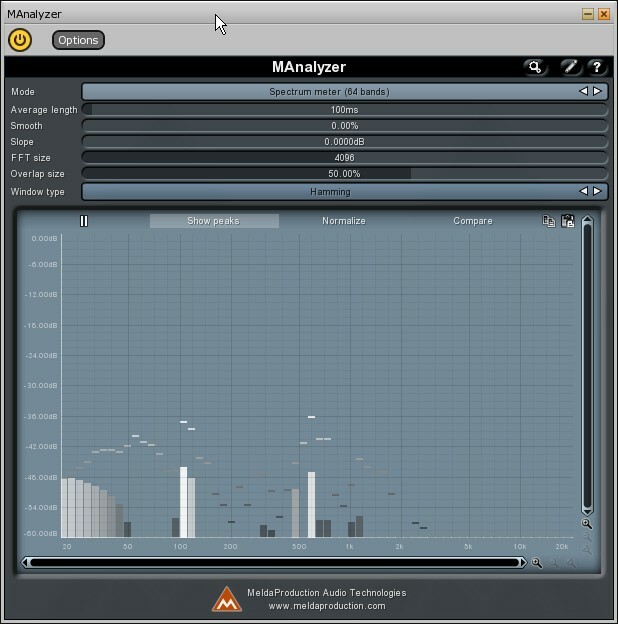 Frequencies were highlighted using the MAnalyzer frequency analyzer. 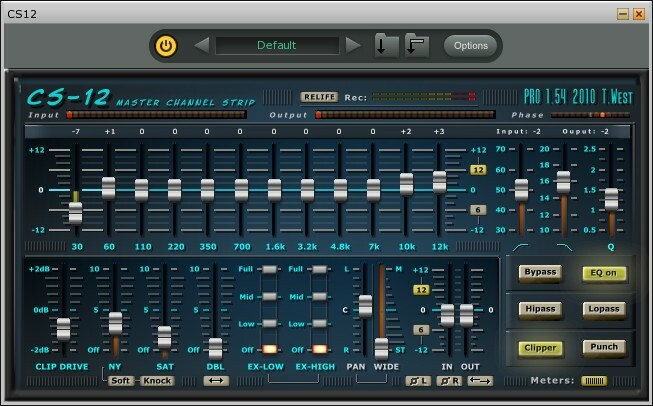 We also used the Modern Limiter to control any clipping that might result from boosting specific frequencies. After the mastering session we demonstrated the EZDrummer Lite drum synth which was available for both the MAC and the PC and includes two complete drum kits and lots of built in grooves to instantly create a drum track. ... Continued to upgrade the Music capabilities of the Gallery MAC system. This time we added the SimpleSynth and some additional soundfonts to provide much richer sounds when played from the keyboard. The Simple synth normally defaults to the embedded GM set of soundfonts (DLS) that are provided with each MAC. Also added was the WWAYM EQ - a 5 band parametric EQ - a VST module for OSX. 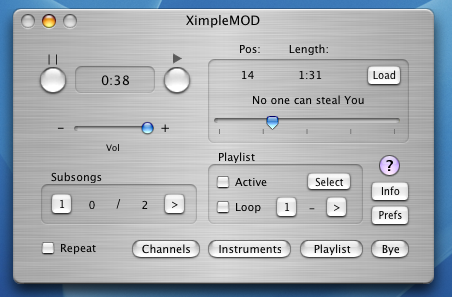 The Ximplemod player was also added and a few MOD files were played and during this time Monz upgraded his MACbook with MuLab and a few VST plugins. Monz went on to create a riff that he mixed down and then using Audacity to trim the riff and converted to an OGG file for distribution. We may see more music from Monz at the next meeting. 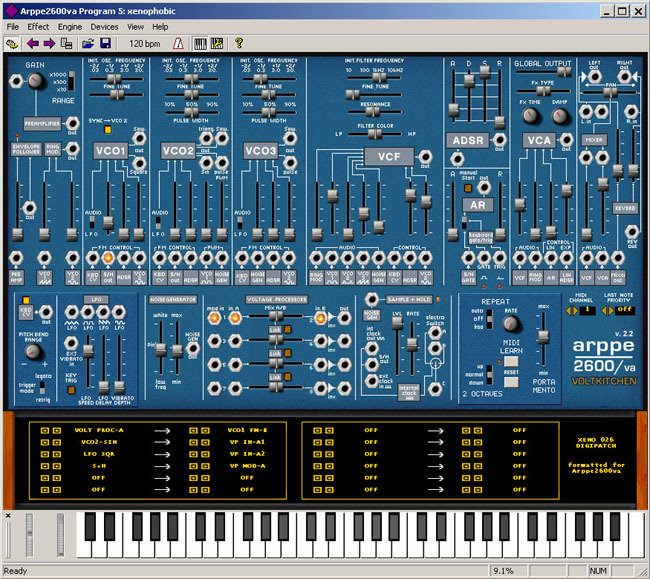 A big hit at the meeting was the programming session on the virtual ARP 2600 that we setup in standalone mode. Everyone had an opportunity to try their hand at tweaking the knobs and placing the patch cables. We also previewed many of the presets that are built into this synth, making it very handy for incorporating these unusual sounds into your compositions. We finished the evening by getting into recording of some 78rpm records using the USB turntable at Sonic Arts. Simply plug this turntable into your PC (or MAC) and an audio port will be created as a stereo input port. We used Audacity to record a few of the older tracks and then an old version of Magix Audio Cleaning Lab to remove most of the artifacts. More on this process and an updated version of the ACL will be available at the next meeting. - Chainer - A simple standalone VST loader and player that allows you to load and string together as many as 99 VST modules (if your CPU can take it). - Acid - The Sony Audio workstation which provides unlimited tracks to create arrangements and loads VST modules. 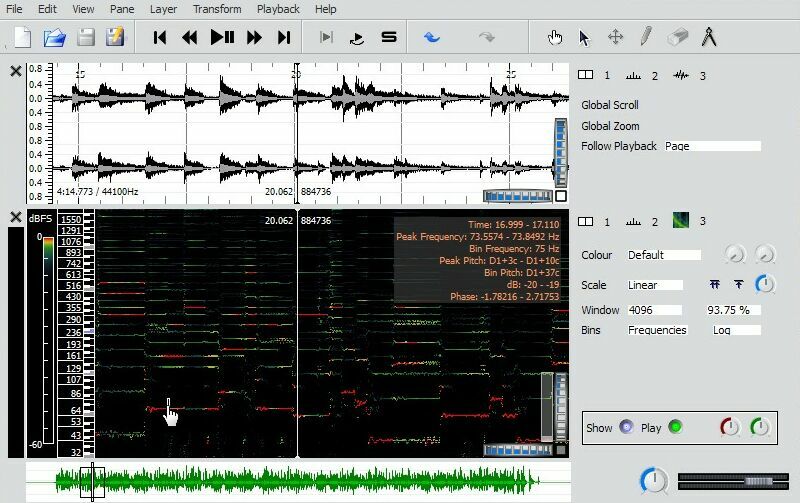 - Wavosaur - An audio editor that provides for the use of VST effects modules to alter an audio file as well as standard audio editing. - Synthfont - primarily a Midi editor and arranger that now provides for VST instruments as well as the use of SoundFont instrument files. - FL Studio - not free, but one of the most bulletproof and CPU friendly DAW on the market. Fully functional free trial available. - Kristal - Strictly an Audio arranger, but provides VST effects on 16 channels of very friendly track editing. - Orion - Oriented around VST module assignment to tracks with midi pattern clips and a pattern arranger. Not free and (IMHO) sort of missed the boat. - Band-In-A-Box - Generates accompanyment to your chord changes. Can use a single VST module that must contain GM support for 16 channels. (NEW Version now available for the MAC). - MuLab - One of the simplest DAW. 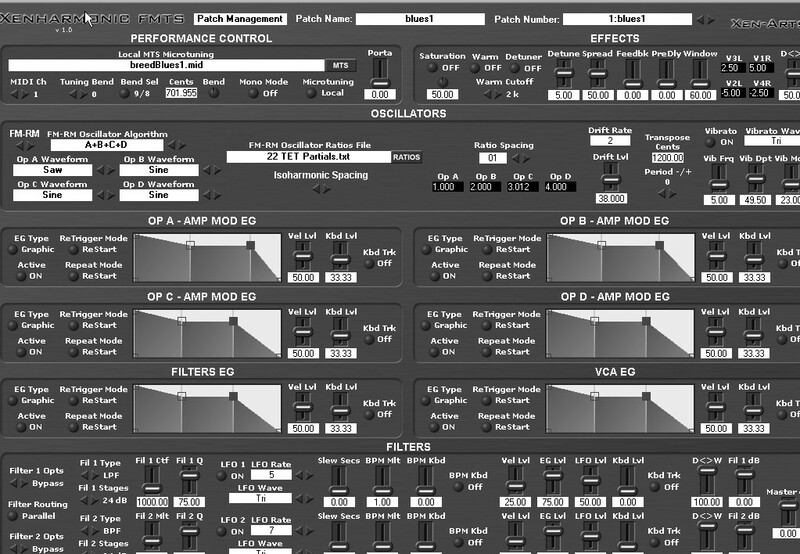 Provides excellent support for VST instruments and effects. Free version llimited to 6 tracks. (see our tutorial). - Samplitude - Included with Computer Music magazine. One of the most complete DAW for Midi and Audio editing and recording. All the demos were performed on a 2.4Ghz Windows XP laptop with a 22 inch display monitor and piped through the Sonic Arts Gallery studio system. This is a free drum set that, contrary to its name, is not small. A huge set of samples, loops and methods for creating drum tracks is offerred by Melda Production as a free download. 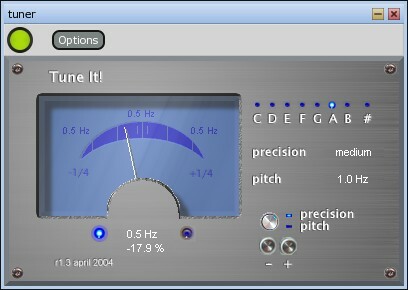 The Mdrummer runs standalone or as a VSTi plugin. The columns on the left are drum kits. The columns on the right are grooves. Pick and play. In addition, at the touch of a tab, throw in intros, chorus bars, verse bars, fills, long fills, etc. Variations are provided for tempo, strength, humanization, etc. This is extremely simple to get a drum track recorded and the kits are very good. A tune by Ludwig van Beethoven - Bagatelle in Bb - was also discussed using the tracks created in MuLab. Music software for the evening was all about the MAC. We went through several DAW's, auditioned many samples, and played witha number of synths and plugins. These were all executed on an iMAC PPC 1.6Ghz running OSX 3.9.1. So this is an older system, and we ran into CPU max on one demo. We also burned a CD with all of the demoed apps, samples and plugins. All of the software was freeware and most is also available on the net. XimpleMOD is a module player that does a fantastic job in loading and playing MOD files in a variety of formats. In addition to the audio, it displays embedded info and provides a way to adjust the sound output. A great little player for OSX . Here's one of tunes (converted to MP3) that was demoed - Dark Dance - composed by Maso in 1991 on a 4 channel tracker. MOD files can also be created and edited in the Milky Tracker, which has a great interface and runs very well especially on the older MAC. Milky Tracker has been released as GPL with binary versions for OSX and Windows and lots of packages for many of the Linux distros. EnergyXT was also demoed. Several different works in progress were demoed. This package is available for the MAC, for Windows and for Linux. The version demoed here was from the May issue of Computer Music Magazine and is assumed to be the same as the trial version available from the EnergyXT site. The demo song supplied with EnergyXT was a bit much for the iMAC and caused the CPU to exceed its capabilities. Muting out the FX tracks put this back in shape. However, a couple of riffs were created to demonstrate the flexibility of this highly flexible DAW. Monz demoed an old version of Finale, which had been originally compiled for Windows 2000, this time running under Wine on Linux Slitaz. Even though this was a really old version, it was capable of creating extremely good notation. A current version of MuseScore 0.9.4 was then demoed, running on Windows XP. This notation system was originally built for Linux but has recently been created as a binary port for Windows. A partial view of an old Cello piece - Lullaby, by John S. Glasier - was used to illustrate the capabilities of MuseScore. Notes are entered in Entry Mode (toggle the N key) and edited outside of Entry Mode (toggle the N key). Once entered, the score can be saved (exported) to native .msc files, .pdf, .mid, .ly, .png, and a few other notation formats. You can also internally play the score as a midi file using a selected soundfont file as the synth. If saved as a standard midi file it can be opened in any sequencer or DAW. Also demoed was the VH-1 Organ VSTi. 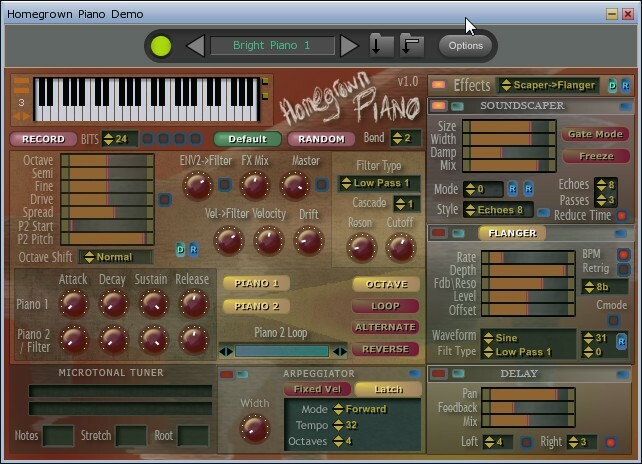 The Organ sounds using just the presets are very nice and can be used in a variety of settings. Using this live was a treat. The recording of Jack Montrose' - Dot's Groovy was used to illustrate one of the sounds that can be created. Another Audio application that seems very impressive is the Chainer. This standalone application has 10 slots for loading VSTi and VST plugins for quickly testing and creating unique sounds which can be saved as presets and also recorded as audio files. Signal path is from slot to slot, top to bottom, for easy setup of sound modulation. In addition, there are 9 more banks of 10 slots that can be routed into the mix resulting in up to 100 VST plugins to be available in a single instance. Detailed control of each plugin is available with Midi Learn quickly assignable to controller movements. This is a very rugged application with great flexibility and is suited for even those with just a fingernail grip on Digital Signal Processing. The example below shows the Adonis synth in slot 1 routed through a Compressor VST and an EQ. We really got off the subject into Rise Of Nations. Monz also had this running on Linux. Although somewhat dated, the game relates to current events nicely. Monz demonstrated the early civilizations and provided many strategy tips for matching wits with your computer opponent Nations. First shown was a USB sound card UCA200 from Behringer. 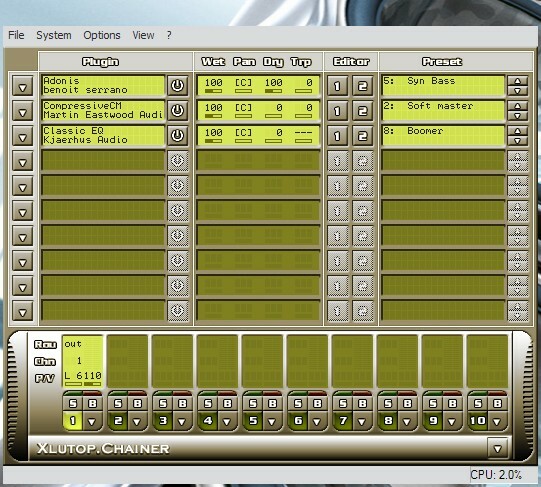 This interface is provided by Behringer for all of their computer interfaced products and provides a 2x2 Audio port when plugged in. It needs no driver. We plugged in to a MAC OSX 3.9.1 system and the port appeared in the Audio system. We also plugged in to Monz' Laptop running SLITAZ (Linux). This required a reboot, but was immediately recognized by the Linux system. I have also tested with a Windows XP and another Linux distro and all have been successful in estabishing the Audio ports - 2 IN and 2 OUT. A similar Unit is also sold by Behrenger as the UCA222. A very versatile and handy device that also adds a S/PDIF port, volume control and a headphone jack. The Groove Analogizer was next. This VST effects module has just been recently released as freeware and operates on an Audio file to add a bit of spice to any rhythm - especially percussion tracks. Simple place the Groove Analogizer as an insert effect in any audio channel and then twiddle the controls (3 sets to produce different effects) that will control the level of interaction and the frequencies for response. Other controls govern effects. This can produce some great effects that compliment the existing rhythm. We also demoed the Ball Sequencer. This is strictly a Midi generator that generates Midi notes as balls hit the 4 walls of a virtual box. You can control the midi note and velocity generated on each hit and the speed of the balls. 6 separate channels (balls) can be released with 6 different midi patches. As far as generating real music, this ends up near the bottom of the heap. But all had fun listening to the nonsense as the balls bounced off of the walls. Might work as a percussion generator for Midi drum notes. The 12WayMonster is a piece generated using MuLab and is based on a set of midi tracks stripped from a Computer Music magazine tutorial. This track features 12 separate synths running amok: Triangle II (4 instances), FabFilter One (2 instances), JX Synth, Ganymed, Asynth, Crystal, CM101, Polyiblit. The intro is a drawn out Crystal pad. At peak polyphony, the 2.4Ghz processor reaches 65% CPU cycles with all synths running. Most of these synths were obtained from Computer Music disks and so a few don't have direct links. Monz demoed a short ( 5 beats) track created in Tonescape using a 72 Equal scale. The notes for this were created by tracking a vocal in an audio file using spectrum analysis to determine the dominant frequency and carefully recreating the note rhythm and matching pitch to a note on the 72 equal scale. Don't forget to waste some musical talent on this web page. Sure to amuse as it cracked up the meeting participants. One of the plugin synths that was demoed was Syng2 by Xoxos. The plugin creates an artificial voice and is midi controlled. It is a little tricky to operate since up to 3 midi channels can be used to form a singing voice. Input from Channel 1 provides the pitch and vocal length; Input from channel 2 is used to provide formant control using dipthongs and Channel 3 can optionally provide phoenems to form words. An internal synth can provide the timbre for the vocals. Here are two examples that I created using Syng2 ... The Lion Sleeps and Secret Agent Man. Easy enough to get something going, but takes a lot more work to get close to real lyrics. The first example was created in Fruity Loops and the second example was done in the new MuLab 2.5 which now incorporates rewire capabilities. Arachnid has 8 pads that can be assigned to any midi note. Each pad has a wealth of parameters that can be used to modulate a sample loaded into each pad. No layers, but you can get a pretty nice sound depending on the sample that you choose. It has reported bugs, but I did not encounter any (maybe the spider got 'em.). I can also set the pads up to match my Axiom keyboard controller. Very easy to set up and bring into the mix. 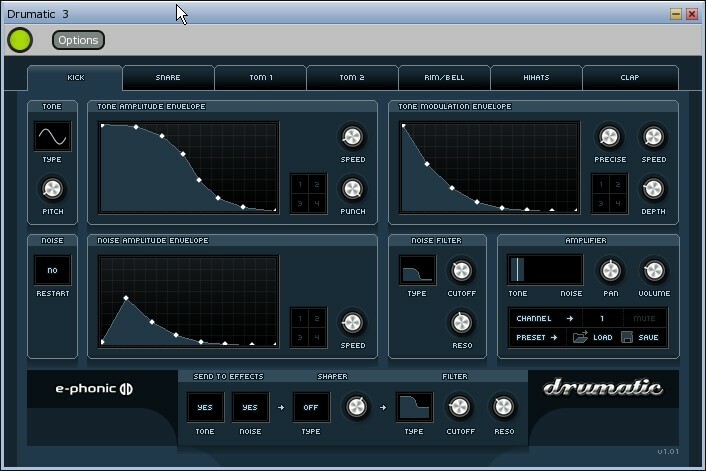 2D_Drum3264 has 17 different drum sounds in three different drumkits. Totally synthesized, but extremely parameter driven and very easy to bring into the mix, since it conforms to GM drum notes. I only tweaked the snare. It has no GUI, so it defaults to your host supplied GUI (as shown above). This is MuLab's built in Sampler. It is very neat in that you can layer many sounds based on velocity and pitch. Also fairly easy to setup. The example above was collected from acoustic drumkit samples and only layered in a few instances to tweak a few of the sounds. This sampler is unique to MuLab, so sounds created here will stay here. The GTdrums patch contains a complete Midi drum range of drum sounds for the Standard Acoustic set. SoftDrum is a VSTi with 12 unique pads that can be assigned to GM or any other trigger notes. Up to 4 velocity layers can be used in each pad. Also it features separate output Groups that allow interaction e.g. a closed hat will cut an open hat sound as well as individual sound adjustment and placement. It has a mild bug that requires you to reload the patch that was saved in order to visualize the settings and samples. But the patch was not loast. Takes a little more setup but is a fine drum machine. Drumatic features 7 pads but encompasses a 13 note range of midi triggers (35 - 47). This is a partial GM midi set, so is useful if you have a basic midi drum track ready to go. Couldn't find any docs for this so experiment was my teacher. Most of the tweak knobs are self explanatory. Also showed of the 1by1 MP3 player which now resides on my USB drive. Stick it into any PC and you have an instant player that will display all of the media files in a Directory. Makes it easy to locate and play any tune. One of my favorite apps. It is tiny (112K) and can use Winamp plugins to choose other Media types in addition to the included MP3 file types. I also created a style and a soloist for Band In A Box that generates piano jazz. Here's a sample of a set which could go on forever - Going Slow. This rendition was laid on top of my 30 minute recording of Club sounds. First off we walked through some of the new features in MuLab 2.0, a Digital Audio Workstation which is in the final stages of release by Mutools. I am assuming that the final release (like the current PreRelease D) will have a Free version that limits the number of tracks (probably 6) but has almost complete functionality. Now that it looks like the Graphic representation is becoming static, I will be preparing an updated tutorial and hope to cover many of the new features. Look for this in October. To summarize the operation of MuLab 2.0, the main display features a menu at the top where you can load and save MuSessions (the entire work in progress) by name. Only one session can be worked on at once but may contain multiple compositions. Sessions consist of midi or audio tracks (or parts) represented across the workspace. At left is the button naming the target of the part - typically a synth or effects Rack. The Racks are displayed below the workspace and contain slots for synths and effects modules - typically VST's and internal MuSynth modules. You can import midi files into MuLab and then assign each part to a specific Rack and load a specific synth into each Rack. Rack inputs and outputs are routable, so one Rack output can be routed to the input of another Rack - useful for Sends. To use external VST modules, you must first use the VST Manager (in the File Menu) to add the VST's location to the list of VST's used by MuLab. 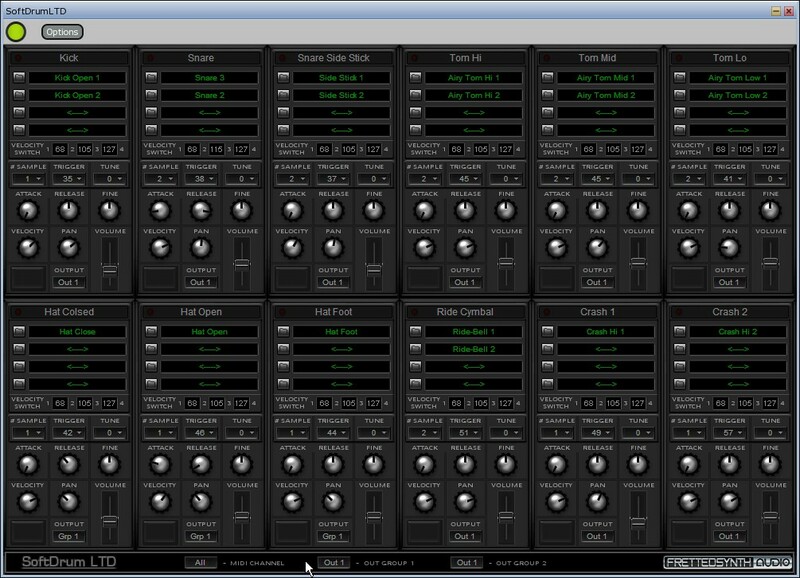 Once added to the list, the VST can be loaded into a Rack. Load a VST into a slot by clicking on an empty slot and selecting the VST module (or internal MuSynth) from the list. From then on, right-clicking on any object in the workspace will usually result in a sub-menu that provides all the editing choices for that object. Double-clicking on a midi track opens the Midi piano roll editor by default. When in doubt right-click to see the options. Using MuLab, we demoed several nice VSTi synthesizers. The Axons by Novaflash has got to be one of the most complete freeware synths available. It features two oscillators, one that can mix two different waveforms, two filters - both with Dry/Wet mixers, a distortion module, an ARP generator, a Voltage Controlled Amplifier (VCA), envelope generators for the oscillators and the amp. The modulator section features two LFO's that can be combined to create almost any modulation and by using frequencies that are not harmonic, the output is modulated randomly - a truly unique feature. One LFO can trigger another. There are two noise generators that can be thrown into the mix. Rounding out the modulation is control over concurrent voices, octave limiting, portamento, 3 ARP channels and a matrix that allows routing of modulation to an extreme variety of Controlled outputs. It also comes with 128 presets. The freakiest thing is the color control that allows you to change the color of the synth. Controls over RGB colors and luminosity make for a million or so different hues to brighten your mood. Here's the Demo Track that features the Axons synth along with Livecut, which randomly modifies any audio loop by beatslicing and rearranging the audio chunks in tempo. Another synth used in this track was Freehand which features the ability to create very rich backgrounds. Lazy Lizard Blues (midi file) was used to demo use of soundfonts. As well as For Tonight (MP3) midi rendered with Soundfont GM ProVitamin set. TuxGuitar - A tablature Editor and Midi editor with notation primarily for Guitar and Bass Guitar. Hydrogen - A very useful multi-track drum machine that contains some excellent samples and quickly builds drum patterns. Both of these programs are standalone and easily installed. They are freeware (donations accepted). Very nice GUI and both programs ran without crashing and are extremely usable to develop music. The BPM Analyzer by MixMeister will analyze all of your audio files and loops in a folder and report the average tempo in each file. Very useful when searcing for audio loops that meet your tempo needs. XMPlay was used to play all of the audio files used. This is a freeware player that plays most audio formats including MOD files and is a quick install that doesn't mess with your PC registry. It has lots of features and many custom settings. Highly recommended. Last up was DreamStation 1.0. An old Audio Workstation (1999). It was released into public domain. The concept has been carried forward into some very modern products, but this can create some awesome music. This track is a medley of 3 of the DSS files that are supplied with Dream Station 1. Listen here. Internally there are no samples - nothing but analog synths (up to 32 sounds can be created) which are then used in a tracker-like interface for sequencing and modulation. Another fun machine that takes a little time to master but can produce satisfying results. The DX2 synth is also available as a DXi plugin. Tuning up with a few VST modules. Using the latest Beta for MuLab as a host, we walked through three different VST modules that detect and display the pitch of a digital audio signal. These were very similar and each would display the note (from a twelve note equal tempered scale) as well as the frequency and the number of cents difference from the true frequency of the note. They can be used to monitor an audio input, but the demo was setup to monitor the pitch of a synthesized note played using a midi keyboard controller. If Setup to monitor an input audio signal e.g. from a microphone, they can be used to tune an instrument. Or in this case, to indicate the pitch precision of synthesized audio. 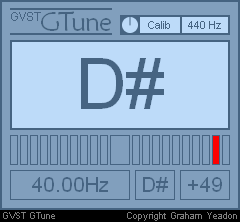 C-Tuner - VST module with needle to show pitch position and accompanying digital display. The C-Tuner was the easiest to use with regard to tuning, configurable as to precision and calibration. Another standalone tuner designed for tuning individual notes was also demoed. This is the Chromatia Tuner which is available at a price of $19.95. It features a variety of calibration features for precision tuning. Hopefully this can be used to tune pianos - one of the evening's goals. The Giesen Guitar Tuner demoed is strictly for tuning guitars but it is optimized for this function. It is a standalone program that is simply programmed to play a perfectly tuned string E-A-B-D-G-E either in order or repeated individually to quickly tune your guitar to the standard tuning. Great little tuner. You can download this flash based tuner or if you are lazy, simply go to the website to tune your guitar. The package is a huge rompler that will load and play a variety of proprietary sample banks provided by EMU. 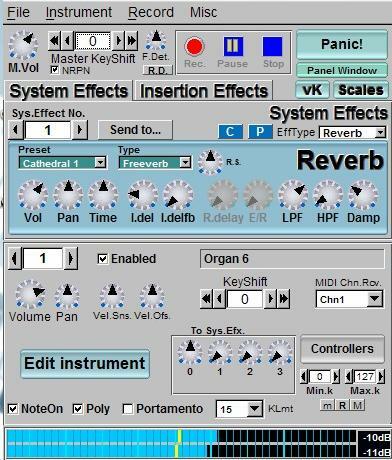 This version is supplied as both a standalone application and as a VSTi synth. The rompler also includes a very detailed manual and over 1000 presets included in the Composer Bank which is supplied with Proteus VX. In addition the rompler includes about 20 effects modules to alter the timbre of each preset and close to 200 effects presets. Supports 16 midi channels as input and multiple output audio buses and 12 different microtonal scales. Proteus VX was demoed both as a VST to show the ability to manage multiple channels as one instance and as a standalone that can be fed by a midi controller keyboard turning your PC into a righteous instrument. We explored quite a few of the 1024 patches and hundreds of effects that are supplied with this synthesizer, but the depth of this synth was hardly scratched. UVI Workstation - Another rompler in Beta form that not only can play midi driven samples, but also will process audio loops (RX2, ACID) as well. Very simple to get something going. Linux music applications were on display. Using a Live CD of Puppy Linux, to boot the notebook, the saved system was held on a USB stick. This combination works very well on a Windows laden Laptop computer. It takes up no space until you boot and takes less time than a normal Windows boot up on XP. The Puppy Linux boot will find the saved system on the USB drive and bring it up exactly where it was left at last use. The boot CD can be removed so the drive can be used for other applications. This Linux system is less than 100MB in entirety. In this case, since the network connection was previously saved as connected to a wireless connection it was necessary to open the Setup Network, a simple click on the ETH0 button and we were quickly connected to the Sonic Arts Gallery Internet connection. Puppy Linux is set up so that programs are executed on a single click. Double-clicking sometimes gets you two copies running at the same time, so be careful. The menu for Multimedia contains most of the music apps. Packages called 'dotpups' (.PUP) can be downloaded. Installing is by simply clicking once on the dotpup file. Once installed, it is necessary to stop/start the menu system to access the new automatic menu entry and icon. Or you can drag the application executable to the desktop to create a shortcut link. 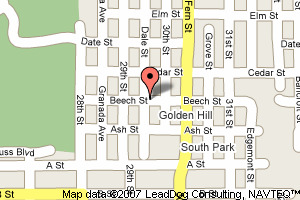 This site has many dotpup applications and there are other sites that can be found using Google. The PET and PUP manager within Puppy Linux has a list of several hundred applications that can be installed via a single click - they are automatically downloaded and installed. Un-install is by clicking on the item in the list of installed PET or PUP packages. Audacity was installed previously from a dotput download and was brought up to demonstrate audio file editing and construction. We also demoed another audio editor which comes standard with Puppy Linux. We also brought up the standalone synth - ZynAddSubFx - which comes complete with banks of hundreds of presets. This synth features Additive, Subtractive and Pad synthesis to create its sounds on the fly. As an example the Additive synth can work with up to 8 independently created voices that are summed and can be saved as a preset. This feature gives the Zyn synth a very powerful and wide ranging palette of sounds. For drum sounds you can also create drum kits (one is provided as an example) that is mapped to separate midi notes for easy drum tracks. The synth handles up to 16 multi-timbrel parts which can be set to correspond any of the 16 midi channels. An additional feature of the Zyn synth is its capability to precisely adjust pitch to a micro-tonal scale which can be mapped in many different ways to incoming midi notes. The microtonal scales can be specified for an octave using floating point steps or you can simply load any one of the 3500 scales now available from the Scala web site. We loaded a very nice Blues based 7 tone scale from the 22 Equal set to demonstrate this capability. An example of the ZynAddSubFx synth using one instance of Zyn synth for 4 separate tracks is Tiny Thing. Puppy Linux contains the default MP3 player GXINE which was used to play the MP3 file above. However, GXINE was found to have a number of bugs and can cause a system crash so it is not recommended. Sadly, I have been unable to get a midi input device connected to Puppy Linux. Tiny Thing was created on the windows version of ZynAddSubFx which can be installed on Windows as a VST module. Our next steps will be to explore how to get an external Midi controller connected to Linux. The latest Beta of MU.LAB (which should be released shortly) was demoed showing how the Zyn VST synth was setup as a single instance that accepted 4 channels of midi input. Monz then demoed Tonescape using his new Laptop which contained Windows Vista and 4 other Linux distros that could be booted simply by selecting from the Boot menu. Ejay Techno 4 - This is a unique dance beat generator that was recently featured as a free offering in CM magazine (CM125). It is one of the easiest music generators to use but has a wealth of sophisticated features that can be used to create specialty music. We walked through a few dance numbers that show the various capabilities of eJay. A track arranger - up to 48 tracks of audio and 3 special synth tracks. A Hyper synth - lead type sounds. Choose from a broad selection of sounds. It has been superceded by Ejay Techno 5, but Techno 4 is still a viable application. This is a 1GB system, which you can add your own loops to make it even bigger. The resulting MIX files are not entirely portable from one machine to another. To Demo this, I was unable to port the MIX from my desktop to my Notebook and had to reenter much of the instrument licks to reproduce the MIX above. KeyMidi - Microtonal midi tone generator. The output of KeyMidi was routed to a Midiyoke input port and the Midiyoke output port was selected as input in the Orchestrator Plus sequencer and recorded the notes and pitch bends generated by Keymidi. The resulting midi file can be saved and edited. NF_Chords1 - This is a midi generator that generates a guitar strum, both up and down and specific chords can be designated as well as the delay between string hits and random velocities. If it looks impossible to play on a guitar, you can at least hear what it sounds like. Using Plugsound Free as a synth (which has a nice electric guitar) and the NF_Chords1 plugin we could enter single midi notes to a track and they would be turned into strummed chords on the guitar. Controls on the plugin allow you to set the chord note spacing and the quickness of the strum. Controls are also there for chord inversion and to set the strum as Up, Down or Up/Down. I was unable to extract the generated midi notes, but the audio track was easily created. We also created a strum program in Band In A Box using the guitar chord solo feature to illustrate rhythmic strumming on the tune. Setting every note to strum 100% of the time allows chords to be strummed at a rate setting. This spaces each note in the strummed chord by a few milliseconds to give you a nice strumming sound to the chords. The 2nd verse of the Red Top Midi File was created by just entering the root note of every chord. BIAB then creates the strummed chord. If viewed in a piano roll, you can see the small separation in time of the midi notes that were created. We discussed and demoed a number of methods to process sheet music into digital format on the computer. In every case, we began with a sheet of music and ended with a midi file that contained the notes from the music. The midi file can be used to drive a synth in a Digital Audio Workstation and create an audio version of the music. One of the approaches used was to scan a sheet of music into PDF format. There are many songs that have been archived in this format. We demoed an old version of Sharpeye that would process a BMP graphics file and produce a Midi file. To get the PDF image into BMP we used a program named PDF Image Extraction Wizard. This program easily makes a very nice graphics file from a page of sheet music. The free version will handle up to 3 pages. The image scanning method depends upon the quality of a digital image. In many cases the image cannot be created in a high quality format. For example we tried taking a screenshot of a music page (PDF). Even though the resulting image is easily human readable, the digital quality was too sparse to be processed by Sharpeye and the result could not be used. Where digital quality is not available, another method had to be used. For these cases, we can work directly from the sheet music and use a shorthand music notation known as ABC notation. This is a musical notation that can be fairly easily learned and is entered through any text editor by following the notation rules. A page of music can be entered fairly rapidly once the ABC notation language has been learned. The resulting ABC text file can be processed by a variety of Notation programs that are available. Typically the programs will process an ABC file and convert the text into Postscript (PDF) format and many of the programs will also generate a midi file of the notes. Many of these programs are free and can be downloaded from the internet. ABC Navigator: was demoed and has the luxury of displaying staff notation at the same time as ABC text is entered in a split window. It will print a Music score and generate a Midi file. iabc: One of the sourceforge projects that will process an ABC file and create a formatted music score and also generate a Midi file. flabc: Also we used this program (the most successful processor) to generate scores and midi files. This program is also available for MAC and Linux, but requires ancillary programs to actually generate the midi files and to create a music score image (process a postscript file). The basic parts of the ABC Notation is standardized but there are several extensions that have recently been added. flabc handles many of these extensions. Monz demoed the Windows KeyMidi program. This tiny program will map a computer keyboard to any Even Tempered microtonal scale. Monz demoed the 72 note scale which takes more than an entire keyboard to map. Although the program normally defaults to the Midi Mapper, you can route the output to any output port on the computer. As an experiment, I used the MIDI YOKE to route the output of Keymidi to the input port of Space Toad and recorded a few chords in a 9 Equal scale. The resulting Midifile - New_MT.mid - contains 3 tracks (to accomodate the 3 note chords) and each note is pitch bent to the 9 Equal tuning. A variety of other tunings were created from this tiny little program. The meeting started with a demo of the Melda mDrummer - Small. An exceptional piece of software that allows you to construct Drum tracks with infinite variation. It has 2 major parts - 1) A selection of drum kits and tunings (on the left) and 2) A selection of rhythms (on the right). Each rhythm is broken into beats, breaks, intros, outros, and long breaks for a huge variety of sound. Controls are provided to vary pitch, tempo, volume, panning, humanization, etc. The freeware version is titled "Small", but it is anything but small since it is a huge download with great samples. The meeting was primarily focused on Sampling techniques with a number of illustrations. A lot of material was covered. We briefly discussed the Edrum Monitor which could be used to enhance a drum machine in getting much better sampled sounds for a drum machine that generates raw midi signals. We started off by demonstrating the capabilities of ShortCircuit. This is one great sampler and sample player. It is capable of handling a variety of formats e.g. WAV, SF2, REX, and a few others. This makes for a flexible VSTi that can bring in and play a lot of useful sounds. MU.LAB was used as the basis for demoing the usefulness of Shortcircuit in building virtual instruments. Sampler functions to modulate the sound are plentiful and easy to use. The first example used only 4 samples pre-recorded from the Chapman Stick across the frequency range of 4 octaves. These were set at the pitch recorded (the root) and then spread to a full octave using the drawing tools of shortcircuit. MU.LAB/shortcircuit is demoed in a tune - Stick It. The Stick and the Bass tracks both were created using Shortcircuit. A slight vibrato was added to help the sound of a normally fingered Chapman Stick. The acoustic bass was created using 36 WAV files. Almost every note in the range was sampled at 2 velocities. Once a patch has been created, it can be saved as a preset. I saved the preset (FXP format) in a folder along with all of the WAV files. This makes for great portability in moving a patch to another location. A better example of the bass patch is here - bassolo4. All of the patches discussed here were saved using this method. We also brought up a spreadsheet created by Erich Neuwirth, University of Vienna. The spreadsheet creates tones which can then be adjusted using harmonics to modulate the basic sine, sawtooth, triangle, or square wave to create a unique tone - a spreadsheet synthesizer. The generated tone was then recorded using audacity and then used as a root wav in Shortcircuit. The tone was re-pitched across the scale to create the first Excel Instrument. Two separate patches were made using the modulation features of shortcircuit. You can listen to the resulting two-track tune - Excel Times Two. Another sample player that was demonstrated was the Yellow Tools Independence Free. This sampler is a 2GB download. But, it contains some great instruments that can create real live sounds in your mix. About a dozen instruments are included, some with several variants in presentation. The size of this sample player puts a strain on my laptop (2.4Ghz, 1GB RAM), so it is only recommended for strong computing platforms. Several guitars were heard doing the Funk Ride. (Same tune as the Excel synth). Another Sample Player that proved to be versatile is the SFPlayer II. This machine was demoed using A variety of soundfonts to illustrate the capability of playing almost any sound quickly. The VSTi contains a wealth of modulations that can enhance the basic soundfont. Clicking on the LOAD button loads a soundfont and if the soundfont responds to multiple banks and program changes, these are displayed for selection. Easily works with any VST host. We demoed several different creations on the spot. Also demoed a tune constructed in Sony's Acid - Lifezine. This was built from professional Greg Adams Jazz Band samples and was the initial start of a project. Subatomic was also demonstrated as used to generate a kick drum. For a tiny little VSTi, it has a wide range of sounds to create a drum sound from deep acoustic bass drum to electronic beeps and clicks. The demo was not recorded. We also explored Usine Free. This is a unique music creation system from sensomusic. The approach they have taken creates an interesting difference from many other computer music creation systems. In one way it is similar to Live, with vertical tracks, but the similarity ends there. Instruments and effects can be built in no time by right-clicking on a workspace and selecting components from a huge categorized list which also includes any VST modules you may have on your machine. Each module has all the connecting points clearly labeled, so it is an easy matter to create links that route midi and audio signals throughout a module to create a patch. Patches can be saved and loaded for re-use. Ctrl/drag from inputs and outputs will create the appropriate control for the patch. Clicking on any module reveals its properties - for editing - at the right of the workspace display. Double-clicking on the workspace, puts it away or brings it back. A small patch with a looped midi sequence, a sampler, an included bass sample was demoed built from the standard Usine components. The manuals are written in tutorial format e.g. follow the instructions to learn the functions of Usine. Learning the different functions was very easy when following the Manual. The only downside to the entire demo was that we could not reduce the display to less than full screen so it could be projected to fit the overhead screen. A ZIP file of 300 Beatles songs in midi format was available for distribution. If anyone is interested in getting a copy of this file (1.8MB), just post a reply in the group. The primary demos were on use of the MAC and several music programs that seem to work nicely on the MAC. Most of these are unique to the OSX platform and more specifically tuned for OSX 10.3.9 (Panther). The demos were performed on an iMAC using a 1.6 ghz Power PC chip and only 256 MB of RAM. Many Apple aplications today seem to be optimized for the 10.4 version of OSX (Tiger) and these applications could not be demoed on this older iMAC. Cat brought her Ketron SD2 sound module which was plugged into the iMAC using an M-Audio Uno USB/MIDI adapter. The nice thing about this adapter is that it has drivers for both MAC and Windows, so it works with almost any PC music application. The SD2 provides many more sounds than those available with the default Quicktime sounds that are provided as the default midi synth. The SD2 sounds are also optimized with effects so that the device contains some very realistic instrument sounds. This setup revealed that some applications on the MAC would not recognize the new port that was created for the Ketron sound module. Quicktime itself does not allow an alternate midi output port (at least the Ketron could not be detected in Quicktime). The Rondo midi player demo that we tried also has no provision for detecting another Midi Out port (the latest version purports to support external devices). However, the external device was easily found and supported by MU.LAB and by the Sweet 16 Midi Player. Authors note: I was very impressed by the Sweet Sixteen Midi Player which has a dumpy looking GUI but is very big on performance when playing MIDI files. We used it to play several of the midi files on the 'ManyMidis' CD, which contained 10,219 midi/karaoke files and was distributed to all the attendees. Another application that was demoed was the XimpleMod. This is a Player for MOD files (IT, S3M, XM, MTM, MOD, UMX and MO3 formats). It lives up to its name, although very simple to download, install and operate, it has lots of capabilities and outputs a wide range of music through its nice looking GUI interface. We also edited some of the MOD files using the MILKY Tracker. This editor has an awesome GUI interface for anyone interested in creating tracked modules. It was very impressive and is able to create WAV and AIFF files so that any finished songs or samples can be exported easily. The MilkyTracker runs on OSX, Windows, and Linux, so it is an all around program. It also has a large library of video tutorials, so anyone wanting to learn tracking could easily get started with this one. One of the files, Dicing With Death, by Danny Mattisen, an XM module, was saved as a WAV file on the iMAC (after the demo and using the MilkyTracker) and then imported into Audacity. This audio editor is a staple on the MAC and allows detailed editing of a variety of sound files. In this case, the WAV file was opened in Audacity, then exported as an MP3 file. Audacity has the ability to export WAV, MP3 and OGG files. The resulting MP3 file was then uploaded to the JohnnyPumphandle web site using Cyberduck - a very handy FTP program. Cyberduck is one of the easiest to use FTP programs available, but is only available for the MAC on OSX. You can listen to the resulting MP3 file - Dicing With Death. The MU.LAB program was discussed at length to show various ways of using MU.LAB to record and edit MIDI sequences, to Record Audio, to Mix Audio loops, and to use Automation to control VST's and MU.LAB controls. Also briefly discussed was the capabilities of the internal MU.LAB synth construction set for creating a variety of synth sounds and effects with GUI controls. This arrangement of Adam's Apple, a riff by Wayne Shorter, was created on the iMAC using MU.LAB. If you missed the meeting, the links are all here, but you missed out on the chocolate chip cookies, pepper jack cheese and some more of Brink's great coffee. Next meeting was scheduled for February 1. I was asked to post some links for some of the demos that we went through on Fri. eve. Those that missed the meeting also missed out on the Clementines and the cookies and Brink's superb coffee. Watermelon man - this was demoed in Samplitude 9. One of the issues was that my 2.4Ghz laptop ran out of CPU cycles during the demo. This demo used a lot of VST modules which caused problems for Samplitude. The rendering was OK.
Midi editing is extremely easy because of the joint display of an event list and piano roll. Also discussed Archibald drum machine which allows you to add vary subtle variations to drum tracks. Using drum samples and your variation limits, Archibald will vary the attack, pitch, timing and velocity of drum hits to simulate a real drummer. Some of the examples were played and discussed. Archibald also will generate Midi drum tracks with variations of timing and velocity. Cheese Whiz - was demoed using Sony's Acid Music Studio 7. This is one of the latest versions of ACID studio and is superb for handling both audio and midi data. - Tutorials are built in with follow the bouncing ball. Also went through some other partially developed songs using Acid Music Studio, but these are not posted anywhere (yet). The features we explored most were the microtonal selections which are set up to place a microtonal scale over as many as 24 consecutive midi notes. The microtonal scales can be loaded from Scala and Astralis CM is equipped with over 100 of some popular microtonal scales. Monz mapped some of these scales to the midi keyboard. We also demoed the Revisit VSTi - a tracker that can be loaded into a host program and then can be programmed to sequence many samples using as many tracks as are necessary. We just touched the surface of this module which is mainly controlled from the computer keyboard (as are most trackers). Also showed off some of the MOD's in both Revisit and in ModPlug, another standalone tracker. Joe Monz is working on a new version of Mahler's 7th Symphony and shared a portion of this work which is being written in Tonescape . He generated a midi file in 31-tone 1/6-comma meantone tuning format which some of the MBC members will try to use to apply to electronic instruments. Results will be posted (if successful). Another version of this symphony is discussed here.